With Full HDTVs you had to sit back from them to get the best experience. There are even formulas to work out the optimum amount. But 4K TVs are so high-detailed that you don't need to worry about sitting too close and seeing the pixels. In fact, the closer the better the experience (within reason). The main issue of which size TV to buy comes down to price. TV sizes in a range aren’t priced ‘linearly’ and this can dramatically affect value. 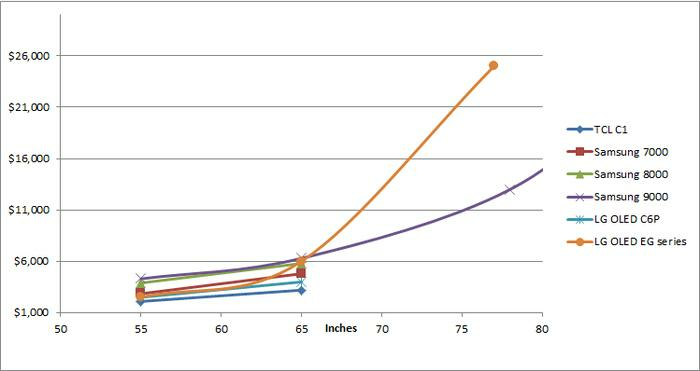 If you plot all the prices on a graph you’ll see that upgrading to bigger sizes costs significantly different amounts. Sometimes moving to a bigger size is great value whereas sometimes it isn’t. On some occasions you get even better value if you don’t buy the next size up but buy the next two sizes up! 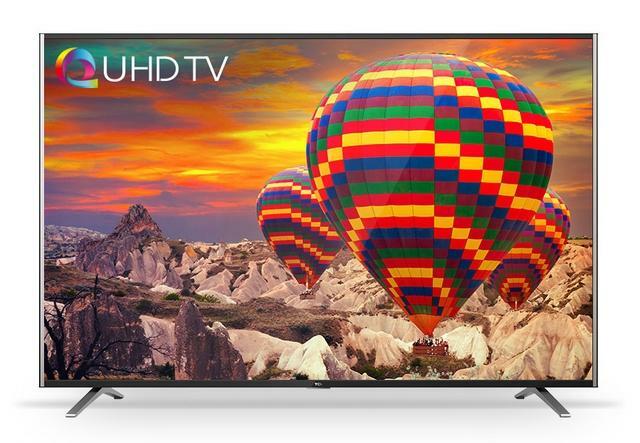 For instance, if you thought about buying a Panasonic 40-inch 4K TV you might be interested to know that it’s only $50 per inch to upgrade to the next size up in the range. However, if you were looking at a Sony X8500 65-inch TV and were interested in upgrading to the next size, it costs $300 per inch! We observe similar with curved TVs but the effect is more pronounced and they arguably have a different sweet spot. Flat screen cost per screen size across different ranges. As you can see from the graph, from 40 inches to 55 the growth is relatively flat – indicating a low cost per inch upgrade price. After that, things tend to head North. Fast. Things tend to go insane at the super jumbo sizes. The (mostly standard) LED side-lighting of the LCD panels starts falling down around 70 inches because the screens are too dang huge to light from the sides. As such, you start getting more-complex rear-lighting and a completely different construction. Nonetheless, most companies say that these outliers are part of the same range despite having relatively-little in common with their siblings. By comparison, going from 40 inches to 55 inches costs you, on average, just $68 per inch. But there are some notable exceptions which jump out at the bottom-right of the graph. LG’s 4K, mid-range, regular-LED TVs (UH8500 and UH7700 series) only go up by $20-$80 per inch up to 65 inches and the prices are low to start off with. There’s high potential for upselling. Meanwhile, Hisense’s excellent Series 7 has a wobble in value where moving from 55 inches to 60 inches costs $150 per inch but then moving from 60 inches to 70 inches costs $100 per inch. Moving on up to 75 inches then costs $200 per inch. So that 70 inch model is something of an anomalous sweet spot in terms of value. 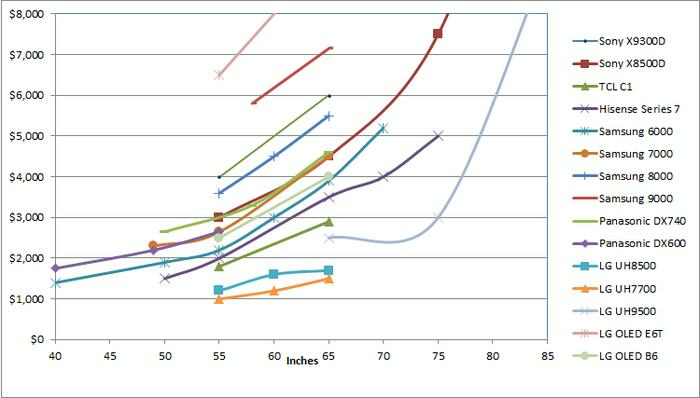 Curved screen cost per screen size across different ranges. Things are harder to track in the world of curved TVs due to a lack of data. However, these generally-expensive TVs mostly increase at a rate of $200 per inch between 55 and 65 inches. Then things go crazy: moving from LG’s already-expensive, $6,000, 65-inch EG Series OLED TV to its $25,000 77-inch variant comes in at a whopping $1,583 per inch. However, curved screens get less closed (curvy) the bigger they get meaning that more people can sit round them without seeing a skewed and distorted image. While $200 per inch isn’t to be sniffed at, it may be that 65 inches is actually the curved TV value sweet spot. We completely realise that most people are constrained by budget first and foremost and that this investigation sounds very much like a first world problem and a half. However, most people buy a TV at some stage, they’ll often use it for hours every single day and they expect it to last several years. So it’s worth knowing where the value sweet spot is not just for all TV ranges but for the TVs within a range too. Home Theatre review: 4K projector vs 4K TV? ​Home Theatre review: 4K projector vs 4K TV?